Sectional doors open vertically upwards and are suspended under the ceiling to save space. This constructional principle means you can make full use of the space inside and in front of the garage for parking. Sealed all round to provide flexibility by being weather resistant to keep out the wind and the rain, can easily accommodate slight irregularities in the floor. Metal structure (rails, profiles) is made of steel deep galvanized providing reliable operation without the occurrence of corrosion. 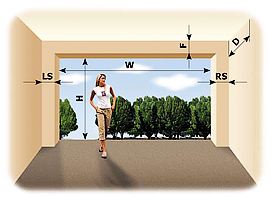 Torsion springs balance the weight of sectional garage doors and provide smooth operation. The guiding rollers are made of high polyamide, which ensures high durability and quiet operation. Columns and Grids must be at the same level. Automatic - sectional garage door is operated by electric motor with remote control, with high standard mechanism for the engine and manual control in case of power failure. Copyright © 2004-2019 LOGEL Ltd.